Oh boy, Earthbound: one of my favorite games of all time. Where do I even start from? Maybe, I should start from the plot, that seems a good starting point don’t you think? 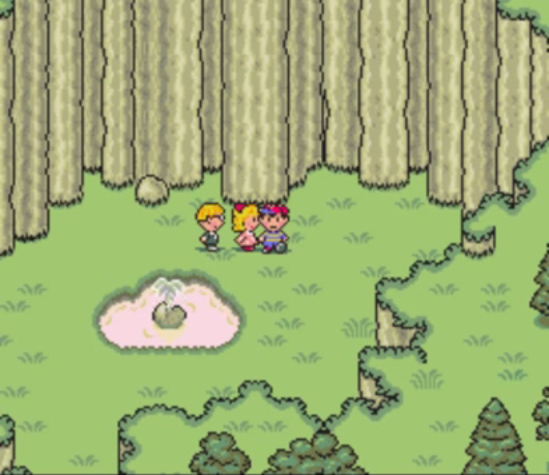 Ok here we go: In 199X, a meteorite falls down near the house of Ness, in the town of Onett, country of Eagleland. Ness, a normal 13-year-old kid, goes out to investigate and discovers a plan made by a race of aliens to take over the earth. There’s an ancient prophecy though: three boys and a girl will be able to defeat the alien race. Ness departs from home, alone, to find the others and fight back the aliens. If you didn’t find the plot interesting, I can assure you that the game is. Earthbound is the sequel to the game named Mother (infact Earthbound is the official localization of its original title “Mother 2”) which was meant from the start to not be your usual RPG game. Why? If you remember, in the era of the NES and SNES, RPG consisted in styles like Final Fantasy set in a medieval-like world, with warriors, knights, elves, wizards, clerics and so on…this formula became the canon for RPGs (doesn’t that work that same way in role play games like D&D? I’m asking, I’m completely in the dark about those games). I don’t know you, but this kind of ambience kind of seems repetitive after a while, making every RPG look like the others. “Super Mario RPG” tried to change this formula, and it kind of did. Even “Secret Of Evermore” did (even though it kind of goes back to it in the 3rd world) but yeah, it did a pretty good job overall (I talk about this game more, on the Secret Of Evermore page). In RPGs, characters use weapons as swords, knives, wands and I don’t even know what. In Earthbound, they use baseball bats, frying-pans, bazookas, yo-yos and use teddy bears as human shields. It’s crazy! And that’s what makes it fun! Bashing cops in the Onett police station. And worry not! You don’t need to have played Mother to play Earthbound. 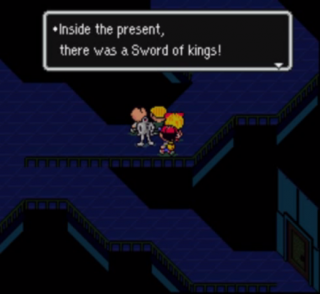 The stories are indeed connected, but there’s no need for you to know what happened in the first one to play Earthbound. And since I still don’t know what to talk next about this awesome game, I’ll just stick with the plot and tell you things as I narrate you Ness’ adventure. You see, right off the bat the game gives you two main objectives: find the other members of the team and find eight mystical places. In this game characters are able to use what it’s called “PSI”. PSI is a psychic energy which comes directly from the earth, and only some are able to learn its ways. 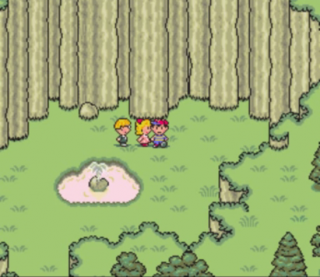 Ness must find eight spots called “Your Sanctuaries” in order to connect his energy with the earth even more (hence the name Earthbound = bounded to the earth). So you have that quest that keeps you going, and then you have to find the other members of the team: Paula a psychic girl who was kidnapped by a creepy cult called “The Happy Happists” (which are often mistook for these guys), Jeff who even though can’t use PSI, he’s able to build fire weapons, guns and bombs; and ultimately prince Poo, the prince of the mystical clan of Dalaam, in the far east. With all their powers combined, you’ll will be able to eradicate the enemy and become strong. But the game isn’t just about the plot. The Mother series is well known for its weird humor (I talk about this a little bit more in my Mother 3 page) and explicitness. It focuses so much on that aspect, that many dialogues and images where censored when the game was ported to America. For example, any red crosses on hospital were removed, some swears were removed, there is a man that drinks coffee in a pub trying to forget the bad things of life, and so on; they would be to many to say them all here. 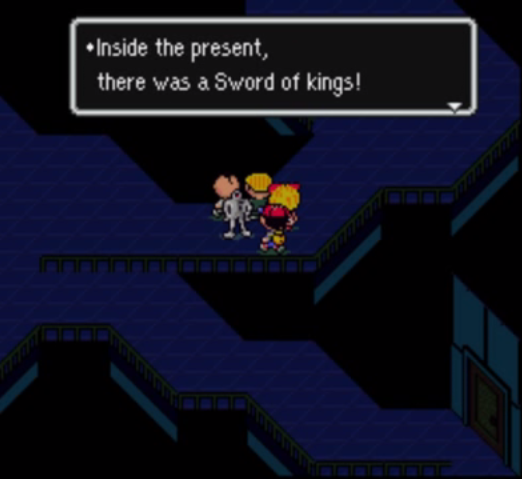 Getting the Sword of Kings, one of the most wanted yet rare items in the game. But what about the game mechanics? Well they are great. I have no regrets about them. Yeah, sometimes they are kind of unfair, but that’s how life is after all, right? The inventory is kind of limited, but then again it makes so you’ll have to choose from what you want to keep and what to throw away. But the most interesting mechanic in Earthbound that I’ve never seen anywhere else (not even the first Mother had that) is what I like to call “Rolldown”. You see, your HP and PP gauge in battle isn’t just a plain number. It’s like one of those counters cars used to have to count how much road they’ve travelled. The point of all that is: suppose you have 300 HP, and an enemy deals 400 damage to you. 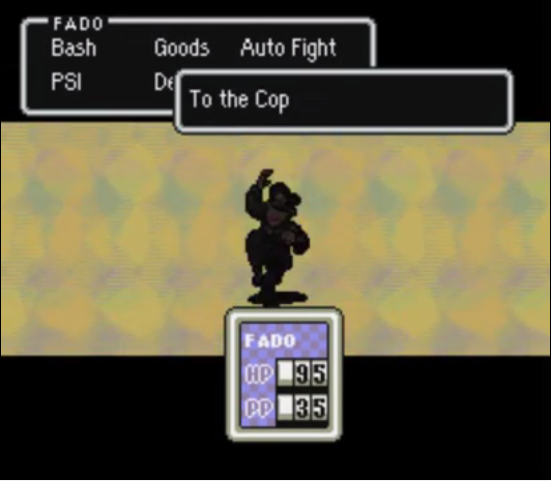 In every other RPG, you would die instantly, but not in Earthbound. The game states that you are taking “mortal damage” but you’re still alive because the counter has to rolldown all the way to 0 before you’re offcially decleared “knocked out”. That gives you the time to do something, such as healing some HP and survive the attack. In the afromentioned example, suppose you heal 100 HP, the counter will then finish to rolldown until it reaches 100. That brings some elements of real time strategy, in a turn-based-game. It turns the game into an action RPG for a moment, since you don’t have time to think, you have to move and cast that Lifeup Alpha and save your friend from potential death! There would probably be some minor things about Earthbound I’d like to add, but I’ll let that be it. Just play this game yourselves if you haven’t already. It’s worth it.